Low carb chicken salad is an easy, healthy recipe to make for a crowd. Make it into a sandwich or serve it chilled for dinner on a hot summer’s day. Ingredients like Greek yogurt, bacon, apples, and fresh dill make this the best chicken salad you’ll eat this summer. Are you searching for a chicken salad with a healthy twist? 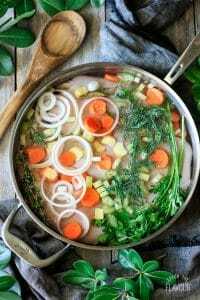 This recipe uses poached chicken for moist, flavorful meat, plus Greek yogurt, mayo, and lots of fresh dill to give it a real summer feel. What goes into a chicken salad? Main Ingredient: Chicken, but people differ on what kind of chicken: grilled, roasted, poached, or canned. Fresh Veggies: the most common are celery, spring onion, red onion, or shallots. Binding Agent: something like mayo, yogurt, sour cream, or salad spread. Something Sweet: grapes, apples, dried cherries, or plum jam. A Nutty Touch: add toasted slivered almonds or pecans. Spices: a mixture of fresh and dried is nice. My suggestions are dill, parsley, paprika, salt, pepper. Depth of Flavor: something sour like lemon juice, something salty like green olives with pimentos, or something smoky like bacon. How much chicken do you need per person for chicken salad? Of course, this all depends if you are having this as the main course on a bed or lettuce, a sandwich filling, or a side dish at a potluck. You’ll also have to take in account who you are serving this to; for example, your athletic daughter and her teammates, your family, or a group of ladies. The suggested serving size is 4 ounces of chicken (or 1/3 pound) per person. How do you prepare chicken salad? First start by prepping all the ingredients for the salad. While you doing this, add a little lemon juice to the chopped apples so they won’t turn brown. Put all these yummy ingredients into a large mixing bowl, but leave a little bacon for the garnish. Next, pull out all the ingredients for the dressing. Whisk the dressing ingredients together in a small bowl until well combined. Fold the dressing into the salad. Transfer to a pretty bowl and garnish with additional fresh dill and bacon. Low carb chicken salad is great served by itself on a bed of lettuce on a hot summer evening, in a sandwich for lunch, on crackers for a snack, or stuffed inside a large beefsteak tomato for an appetizer. Savor every bite of this salad, and feel good knowing this recipe is low carb, low sugar, and high in protein. Learn how to make great chicken salad sandwiches with these other recipes. How to Poach Chicken Breasts: learn the secrets to perfectly moist, low-fat, flavorful poached chicken. 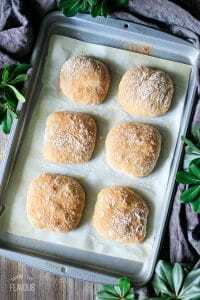 How to Make Chewy Ciabatta Rolls: it takes just a few basic ingredients and some sticky fingers to make these amazing rolls. How did you like this chicken salad? Share your thoughts by leaving a recipe rating below. Whisk all the dressing ingredients in a small bowl until thoroughly mixed. Adjust seasonings as desired. Cook the four strips of bacon in a large cast iron skillet over medium heat. Flip the slices over with a fork. Once they’re crispy, remove from heat and drain the slices on a paper towel-lined plate. Let cool, then crumble, or cut the slices into 1/4 inch pieces. Cube the poached chicken breasts and place in a large mixing bowl. Juice 2 room temperature lemons to get 4 tablespoons of juice. Cube the apple into small pieces, making sure to remove the core and seeds, but leave the skin on for color and crunch. Toss the cubed apple with 1 tablespoon of lemon juice to prevent the apple from discoloring. Add it to the large mixing bowl. Cut the celery, red onion, green olives, dill, and parsley, then add them to the large bowl. Mix everything together thoroughly. Add the dressing to the chicken salad and mix well to combine. Pour in two tablespoons of lemon juice, and sprinkle in a little salt, paprika, and black pepper. Stir and adjust seasonings to taste. Cover and refrigerate for at least two hours. Serve the chilled salad in a sandwich or lettuce wrap, with crackers, stuffed inside a hollowed-out beefsteak tomato, or just on its own. Keep the chicken salad covered for up to 5 days in the refrigerator. It doesn’t freeze well, due to the mayo separating and the apples getting soft. But if freezing it is important to you, use a salad spread instead of the mayo and replace the apples with dried cherries.